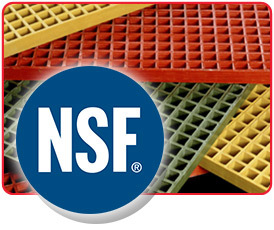 DURAGRATE® premium polyester, non-fire retardant (NPP) and vinyl ester, non-fire retardant (NVE) molded grating has received NSF-61 certification in extreme temperatures. Strongwell’s DURAGRATE® NPP and NVE molded grating is the first in the industry to receive both hot and cold temperature NSF certification. The NSF official listing certifies that the DURAGRATE® NPP and NVE gratings are both acceptable for use in potable drinking water. NSF testing concluded the submitted DURAGRATE® samples are able to withstand hot temperatures of 140°F and also cold temperatures. The fasteners used with the NPP and NVE gratings have also been NSF certified. DURAGRATE® is an ideal solution for water and wastewater treatment plants because the grating is strong, lightweight, corrosion resistant and can withstand extreme temperatures. DURAGRATE® NPP and NVE gratings have been added to a list of Strongwell’s NSF certified fiberglass products. Other NSF certified products include EXTREN® Structural Shapes and Plates, COMPOSOLITE® Building Panels, SAFPLANK® Interlocking Decking System, Baffle Panels, and Flight Channels. You can visit our NSF listing to learn more.